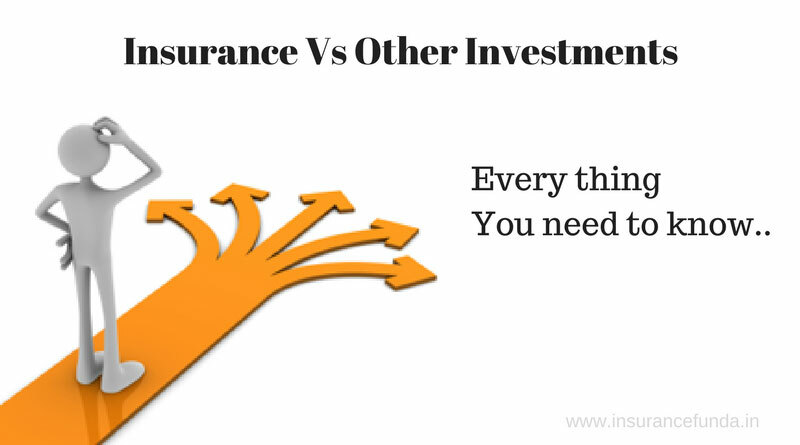 Insurance Vs Other Investments – Every thing you need to know. May be you are in a happy moment with some money in hand to invest or want to get yourself prepared for a future expense. Well, what ever may be the case, in the current financial scenario, there is a plethora of investment options available to all. Insurance is one among them. You may be interested to know how insurance as an investment performs when pitched against other investment options available. Before going deep into the comparisons, let us have a look at some basic points every investor should be aware of. The words ‘Investment’ and ‘Savings’ are generally considered synonymous by many, but, the fact is that they are entirely different in their scope and purpose. To make it simple, we ‘save’ money to make an ‘investment’ at a later time. Generally investment needs a bulk corpus fund which is created through savings plans. So it is better to approach insurance linked savings and insurance linked investments separately. Why do you need a savings plan? Financial needs of the future are often overlooked till they knock at your door. And invariably you will be late for starting a new at that point of time. So it is always advisable to start as early as possible. The principle of ‘Risk – Return trade off‘ clearly states that ‘low level of risk’ is associated with low returns investments where as ‘high level of risk’ is associated with high return investments. In other words invested money can render higher profits only if the investor is willing to accept the possibility of losses. So before aspiring for highest returns available in the market it is wiser to decide on the level of risk you can take for that investment. Generally Insurance policies provide two types of benefits viz. Insurance benefits and Investment Benefits. So naturally the insurance policy premium includes both these components. If you want to compare an insurance policy with other investments, these components need to be separated. Read a detailed article on separating the insurance and savings components in an insurance policy premium and then calculating the rate of return from the link given below. From this article you can see that savings element of LIC’s Endowment plan is providing an interest rate of around 7.93 % compared to the bank interest rate of around 6%. Internal rates of returns of other schemes can vary based on the benefit pattern of the scheme. Popular alternative investment options available in India. Let us have a look at the top 10 investment options available in India. Equity or Share investment bears high risk profile. Even though there is a chance of getting high returns over long term, risk of loosing the invested amount also is there. Cautious approach is recommended here. Segment the investment corpus available based on your risk appetite and invest only a portion of it. The new tax regime introduced by Government of India has imposed Long Term Capital Gain Tax for equity investments and is bound to reduce the returns by 10 % from 2018-19. On the other hand, Insurance investment provides low risk investment opportunity with medium returns. Those who are investing in Shares can look for insurance investments to compensate and complement the high risk involved in share market investment. Mutual Funds Vs Insurance Investments. Mutual fund is an investment vehicle made up of a pool of moneys collected from many investors for the purpose of investing in securities such as stocks, bonds, money market instruments and other assets. Even though mutual fund involves slightly lower risk compared to direct equity investment, risk involved is still high compared to other investment modes. Long Term Capital Gain Tax is applicable to mutual fund investments also. As in care of direct equity investments, Mutual fund investments along with insurance investments provide a balanced risk profile. Real Estate investments can provide good investment returns in long run. But, several external factors in which you don’t have active control will have to work together to give you good returns here. Your investment may bear the risk factors including Government Policy decisions and changes in the land usage related rules. Further, real estate investment involves huge fund corpus and provides low liquidity. You may not be able to en cash your property as and when the need arises. Insurance Investments, along with real estate investments can help you to create provisions for some degree of liquidity, utilising loan facility available with insurance investment. Investment in Gold can be done through two modes. Ornaments and Gold Exchange Traded Funds (ETF’s). Purchasing gold ornaments as investment option is not recommended as it will involve making charges and other charges which eat into the principle amount invested. Another option is to invest in Gold exchange traded funds (ETF). The chart provided below will give you an idea on the returns provided by top ETFs. The returns provided by ETF investment in medium term is really low compared to insurance investments. Bank Investments Vs Insurance Investments. In the current economic scenario, bank interest rates continue to dwindle day by day. Latest bank FD Rates of major banks are shown in the table given below. Bank interests are subject to the Income Tax and the returns shall be reduced by the applicable tax. On the other hand, insurance investments are following double exemption pattern. The premium paid is eligible for income tax exemption under section 80C and the maturity is exempted under section 10(10D) of income tax act. One other hardship faced by investors in case of bank Fixed Deposits are, interest rates are not guaranteed for a longer period. If a person wants to do a fixed deposit for the marriage or education of his daughter for a longer period (Say for 15 Years) he will not receive the same interest rate through out the period. He will have to reinvest the amount several times, at the interest rate available as and when the FD matures. In the current scenario of reducing interest rates, he may not get the expected returns at the time of maturity. The advantage of bank fixed deposits are the high degree of liquidity it offers. So it is the most sought after method for parking emergency funds. As per the latest announcement of Government on the post office small savings interest rates, interest rates has been reduced around 20 BPS or 0.2% for all its schemes (except Savings Account ) for the period Jan to March 2018. The latest post office Small Savings interest rates are given below. Senior citizens scheme is offering the highest rate of interest at the rate of 8.30% followed by Sukanya Samrriddhi Scheme. Read every thing about Recurring Deposits and calculate the maturity value of RD using RD Calculator. I have given an over all idea on the alternative investment options and the possible returns here. Please go through it and take informed decisions.